independent ISO 5840 and 17025 results from ViVitro Labs. 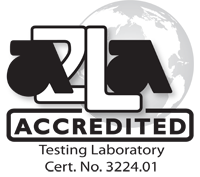 Our laboratory testing services are accredited by the American Association for Laboratory Accreditation (A2LA) and are based on ISO 5840. ViVitro Labs Inc. holds ISO/IEC 17025:2005 accreditation for: Cardiovascular Implants – Cardiac Valve Prostheses. We also offer non-accredited testing service for clients seeking quicker, less costly Preliminary Evaluation and Feasibility Testing. See more information on Why use an ISO 17025 Accredited Laboratory. 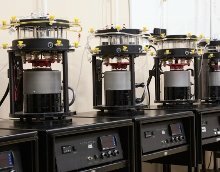 ViVitro Labs is a member of the ISO 5840 standards committee and is actively engaged in developing testing standards to assist in regulatory submission. ViVitro Labs ensures that test protocols will meet evolving regulatory requirements. Read our Guide to ISO 5840 Testing. A priori defined acceptance criteria such as acceptable pressure drops, retrograde flow, etc. Our test plans and reports are designed around approval bodies, thoroughly researched, and justified to ensure they are regulatory appropriate. 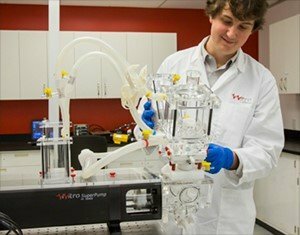 DAY IN OUR LAB gives access to ViVitro equipment and the use of one lab tech for an entire day in Victoria, Canada. This low-cost option gives immediate access to ViVitro expertise and equipment. Customer satisfaction surveys are an integral component of our Quality Management System (QMS) and a requirement for ISO 17025 accreditation. We encourage clients to take this short survey managed by ViVitro’s QA department. We understand how critical your timelines are. We work to your schedule and deliver to our commitments. 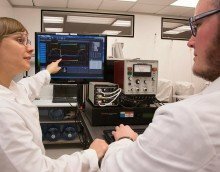 We design unique tests to meet specific developmental needs. For studies used for regulatory approval this is a must. Our trained researchers, calibrated equipment, and internal audits meet ISO 17025 standards. All of our feasibility studies are developed via no-cost, no obligation, collaborative consultation. We happily provide Non-Disclosure Agreements for all services, including initial consultation.